Antoine Caron’s Dionysius the Areopagite Converting the Pagan Philosophers is as enigmatic to us as the solar eclipse would have been to sixteenth-century witnesses. The painting shows a Greco-Roman cityscape with a group of men centered in the foreground, mirrored by another group of men in the middle ground. In the background, people run in different directions. The chaos of the scene is heightened and dramatized by the blackened disk with an orange aura that looms in the darkening, incarnadine sky. In the midst of the chaos, the geometric architecture provides a sense of solidity and stability that is reinforced by the calm of the central foreground figure. The identity of the foreground figures and the nature of the celestial event are equally ambiguous. Many historians believe that Caron was emulating Raphael’s School of Athens and that the celestial event is a solar eclipse. 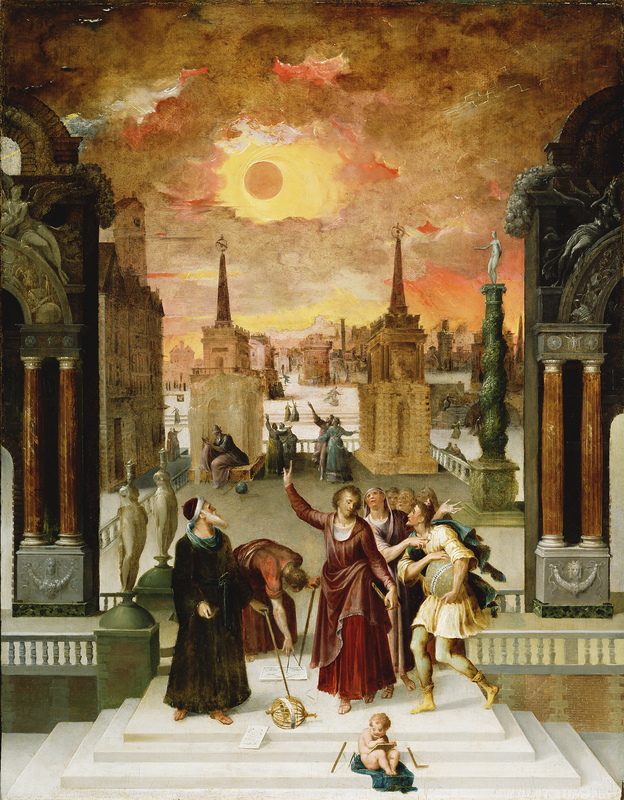 Solar eclipses had occurred in both 1571 and 1574 and perhaps served as Caron’s inspiration, but the artist’s mannerist and fantastical style makes the astronomical event scientifically ambiguous. The unusual color of the sky may instead represent “blood rain”—a phenomenon still not completely understood. Historians have been able to identify some of the buildings in the background as well-known sixteenth century French buildings. An alternate title for the work has been Astronomers Viewing an Eclipse, which favors a more secular and contemporary interpretation than the reading that the Getty Museum offers, which posits an Early Christian subject. Given that Caron was a French court painter when Catherine de’ Medici was supporting astrology, and that France was struggling to remain united against Protestantism, Caron may have used the subject to comment on current events.